I never know how to respond when people ask me if they should use Kickstarter to start their business. After all, I've seen just as many Kickstarter failures as I have successes. I also refrained from sharing my experience with Kickstarter simply because we launched a successful Kickstarter "campaign" while many, including some of my friends, have failed. It's obnoxious, I know. But I've been listening to a wonderful podcast by Alex Blumberg (aptly named StartUp) and had a change of heart. Sharing my experiences along with the color commentary might help someone out there in a galaxy far, far away. And my friends have been egging me to write because I might be able to reach some inspired entrepreneur in the nethers of the internet. Perhaps someone who is drawn to articles about crowdfunding may find my musings helpful, if not mildly entertaining. We had always chronicled our startup journey from the beginning, starting way back in 2011. In the vein of Everlane, we want to be radically transparent, especially in the food and beverage industry which is known to be somewhat clandestine. So here I go... about to tell the internet how to best run a Kickstarter campaign from a one-time Kickstarter pro. There are a lot of topics to cover, so this series is broken up into five parts. Enjoy! 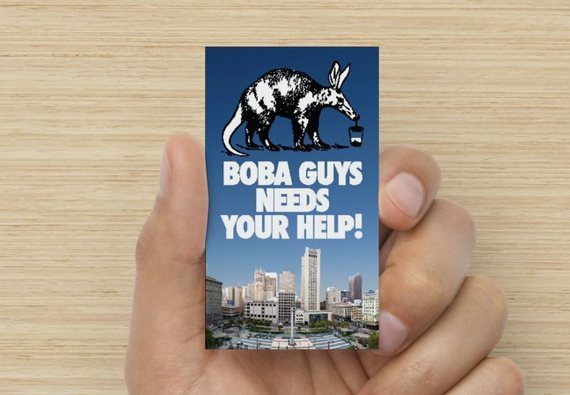 Our startup, Boba Guys, a food concept in San Francisco, raised over $33,000 to create Boba Guys Labs this past year. It funded a portion of our second storefront that would be used to create recipes and give our community a deeper glimpse into our business. For more information on our campaign, click here for context. It's a bit embarrassing to share this link to random strangers, but it's the best way to illustrate the points that I will make in this series. Candidly, it's like showing people what we've written in our high school yearbooks--so young, so naïve, so wide-eyed and bushy-tailed! Why Crowdfunding for a Food Startup? If you're reading this, you probably have at least moderate interest in crowdfunding. Like me, you may have heard about it from friends who shared a link on Facebook or read news about the historic Pebble launch or game-changing Ouya campaign. I did have a cursory notion of crowdfunding when I was in graduate school while learning about the impending JOBS Act. (For more information, I highly recommend listening to StartUp's explanation on this podcast.) However, when it came to our own business, crowdfunding was at the bottom of the list of financing options. It wasn't because of return-on-investment or anything related to money. Our hesitations were personal. It was risky enough to broadcast our startup experience on GOOD Magazine. We didn't know what we were doing and looked pretty silly on occasion. To do it again on a much larger scale--and with a concrete goal-- tempted fate. There's one thing I hate more than failing and that's failing publicly. Exposing yourself to public humiliation is something I try to avoid. I know it's not something a passion-driven, single-minded entrepreneur would say, but it's the truth. Somewhere along the way, we had lost the fearlessness that we had when doing our first pop-up. We had to regain our startup mojo. It started when it came time to decide on how to fund our second store, we were looking for an extra $30,000 to $50,000 for some breathing room for our fun little side project. We did not expect Boba Guys to take off, so our personal finances weren't exactly ready for the first store's initial buildout. My business partner mentioned doing a Kickstarter campaign because several of our friends did it. I had my hesitations; primarily, because we rarely saw food retail businesses raise substantial funds on Kickstarter. To me, a campaign that raises $15,000 isn't worth it hassle -- and according to our research, few campaigns of our type ever raised more than $10,000. I had also heard horror stories from friends that ran crowdfunding campaigns only to take home 20-30 percent of the amount they raised. "It's a lot of work. Make sure it's worth it," one friend told me. After months of wavering, we agreed to only do Kickstarter campaign if we could harness the power of our community. The truth is that countless fans -- those who came every week to our first store -- said we should do a Kickstarter campaign and they would gladly support it. Most people knew that we funded the first store entirely out of our own pocket, so our story would resonate with the community. As one of friends put it, Boba Guys is "the little boba shop that could." Our friends in the industry also said that a Kickstarter campaign might help with publicity and attract potential investors. At this point, my business side bought into idea the crowdfunding. However, I had to overcome my main hangup: how could we raise money without compromising our core values of quality, transparency, and giving a damn? We did not want to be seen as money-grubbing entrepreneurs or two guys who didn't know how to run a business properly that resorted to crowdfunding. We had built a following because we prided ourselves on doing the right thing. For instance, we had been upfront about our profits motives and values from the very beginning. The Kickstarter campaign had to be genuine and personal. Essentially, we should only take money from the public if we could ensure that we'd be doing the right thing with it. It took a lot of coaching from our mentors, but we eventually agreed that crowdfunding was the best way to grow into our second store. We had an idea that we'd create a room dedicated to our fans. That would be the cornerstone piece to our campaign. We wanted our store to bring the community together and allow our backers (i.e. those who pledge money to your campaign) to participate in our growth. Many of our best customers followed our story from the very beginning, when we were just two guys making boba in rice cookers in our friend's ramen shop. We owed it our fans to find ways to keep our business connected to them on a personal level. We also made it a priority to design a campaign that was unique to us. In one of our IM conversations, I wrote to my business partner, "how could we make the [Kickstarter] campaign more personal? We don't want to give off the impression that we're raising money simply because we need money. The truth is we don't really need it." And that's how we regained our entrepreneur mojo -- we redefined what a successful campaign looked like. It wasn't about hitting our goal, because we really didn't need the money per se... or at least we didn't need it from a Kickstarter campaign. To us, the campaign was about bringing our fans together and sharing our journey with them. Sure, we hope to hit our goal, but if thousands of people shared our story, that would be enough. There was nothing to be ashamed about if we tried our best. Our fearlessness was back. As we unpack our campaign and provide you the mundane and not-so-mundane details, we did want to close our this first entry with one point of emphasis: crowdfunding is an inherently social interaction. You are taking people's money and most of them are strangers. Generally speaking, they are supporting you and your story, and not necessarily your product. That is why crowdfunding "worked" for us. It's not right for every situation, but our business, as I had previously written, is inherently social and built by the people. Everything -- from our rewards to our communication mediums -- revolved around how to make things personal. That will be a reoccurring theme in this series. And lastly, that is why I did not write on my column for over half a year. As I discuss the pros and cons of running a crowdfunding campaign in future articles, I did not want my column to invalidate or artificially inflate our experience with crowdfunding. As I continue to write about my experience, I will get even more candid and hopefully provide some insight into both the logistics and psyche of running a crowdfunding campaign.